มีข้อขัดแย้งในออสเตรเลียว่าควรจะใส่กรดโฟลิกลงในผลิตภัณฑ์เช่นขนมปังหรือแป้งทำอาหารหรือไม่ ประเทศออสเตรเลียและนิวซีแลนด์ความจริงได้ตกลงร่วมกันเสริมอาหารผ่านการควบคุมขององค์กรมาตรฐานอาหารออสเตรเลียและนิวซีแลนด์ (Food Standards Australia New Zealand) ออสเตรเลียได้เสริมแป้งทั้งหมดตั้งแต่วันที่ 18 กันยายน 2552 แม้ว่า มาตรฐานจะเป็นสำหรับทั้งออสเตรเลียและนิวซีแลนด์ แต่รัฐบาลออสเตรเลียก็ได้กล่าวว่า ขึ้นอยู่กับนิวซีแลนด์ว่าจะใช้มาตรฐานนี้หรือไม่ มาตรฐานบังคับให้เสริมโฟเลต 0.135 มก. ต่อขนมปัง 100 ก. ↑ "Folic Acid". The PubChem Project. Archived from the original on 7 April 2014. ↑ 2.0 2.1 2.2 2.3 2.4 2.5 "Folic Acid". Drugs.com. American Society of Health-System Pharmacists. 2010-01-01. สืบค้นเมื่อ 2016-09-01. ↑ "Definition of vitamin Bc". Medical-dictionary.thefreedictionary.com. สืบค้นเมื่อ 9 September 2012. ↑ 5.0 5.1 Darby, William J.; Jones, Edgar (1 November 1945). "Treatment of Sprue with Synthetic L. casei Factor (Folic Acid, Vitamin M)". Experimental Biology and Medicine. 60 (2): 259–262. doi:10.3181/00379727-60-15154P. สืบค้นเมื่อ 13 December 2014. ↑ "Changes to the Nutrition Facts Panel - Compliance Date". US Department of Agriculture. สืบค้นเมื่อ 9 August 2018. ↑ Bailey, Lynn B. (2009). Folate in Health and Disease, Second Edition (in อังกฤษ). CRC Press. p. 198. ISBN 9781420071252. Archived from the original on 8 September 2017. ↑ 10.0 10.1 10.2 10.3 10.4 10.5 10.6 "Dietary supplement fact sheet: Folate". Health Information. Office of Dietary Supplements, US National Institutes of Health. สืบค้นเมื่อ 2016-09-01. ↑ Pommerville, Glendale Community College Jeffrey C. (2009). Alcamo's Fundamentals of Microbiology: Body Systems (in อังกฤษ). Jones & Bartlett Publishers. p. 511. ISBN 9780763787127. ↑ Marino, Bradley S.; Fine, Katie Snead (2009). Blueprints Pediatrics (in อังกฤษ). Lippincott Williams & Wilkins. p. 131. ISBN 9780781782517. ↑ Pond, Wilson G.; Nichols, Buford L.; Brown, Dan L. (2009). Adequate Food for All: Culture, Science, and Technology of Food in the 21st Century (in อังกฤษ). CRC Press. p. 148. ISBN 9781420077544. ↑ "Folic Acid". International Drug Price Indicator Guide. สืบค้นเมื่อ 2016-09-01. ↑ Chambers Concise Dictionary (in อังกฤษ). Allied Publishers. 2004. p. 451. ISBN 979-8186-06236-3. ↑ "Folic Acid". NIH LiverTox. 2 June 2017. Archived from the original on 7 January 2017. ↑ "FAQ's Folic Acid". CDC. 16 December 2016. Archived from the original on 10 July 2017. ↑ "Nomenclature and symbols for folic acid and related compounds". IUPAC-IUB Joint Commission on Biochemical Nomenclature. Archived from the original on 6 February 2007. ↑ "Definition of vitamin Bc". Medical-dictionary.thefreedictionary.com. สืบค้นเมื่อ 2012-09-09. ↑ "Folic acid 'reduces stroke risks'". BBC News. London. 2007-05-31. ↑ 57.0 57.1 "Folate deficiency: MedlinePlus Medical Encyclopedia". www.nlm.nih.gov. สืบค้นเมื่อ 2015-11-16. ↑ Diaz, V. H. US Patent 20080020071, Jan 24, 2008. ↑ Lohner, Szimonetta; Fekete, Katalin; Berti, Cristiana; Hermoso, Maria; Cetin, Irene; Koletzko, Berthold; Decsi, Tamás (2012). "Effect of folate supplementation on folate status and health outcomes in infants, children and adolescents: A systematic review". International Journal of Food Sciences and Nutrition. 63 (8): 1014–20. doi:10.3109/09637486.2012.683779. PMID 22574624. ↑ 64.0 64.1 "Dietary Supplement Fact Sheet: Folate". National Institutes of Health. ↑ "Dietary Reference Intakes for Thiamin, Riboflavin, Niacin, Vitamin B6, Folate, Vitamin B12, Pantothenic Acid, Biotin, and Choline" (PDF). National Academy Press. 2001. pp. 196–305. ↑ Owens, Janel E.; Clifford, Andrew J.; Bamforth, Charles W. (2007). "Folate in Beer". Journal of the Institute of Brewing. 113 (3): 243–248. doi:10.1002/j.2050-0416.2007.tb00283.x. ISSN 0046-9750. ↑ "USDA Nutrient Database (Table)". United States Department of Agriculture. สืบค้นเมื่อ 2014-08-14. ↑ Dietrich, M; Brown, CJ; Block, G (2005). 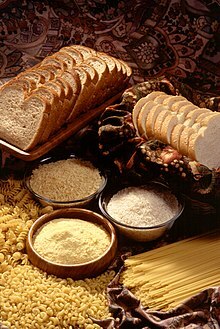 "The effect of folate fortification of cereal-grain products on blood folate status, dietary folate intake, and dietary folate sources among adult non-supplement users in the United States". J Am Coll Nutr. 24 (4): 266–274. doi:10.1080/07315724.2005.10719474. PMID 16093404. ↑ Suitor, CW; Bailey, LB (2000). "Dietary folate equivalents: interpretation and application". J Am Diet Assoc. 100 (1): 88–94. doi:10.1016/S0002-8223(00)00027-4. PMID 10646010. ↑ 71.0 71.1 "Effects of Cooking on Vitamins (Table)". Beyondveg.com. สืบค้นเมื่อ 2012-09-09. ↑ Cabanillas, M; Moya Chimenti, E; González Candela, C; Loria Kohen, V; Dassen, C; Lajo, T. (2009). "Usefulness of meal replacement: analysis of the principal meal replacement products commercialised in Spain". Nutr Hosp. 24 (5): 535–42. PMID 19893863. ↑ 73.0 73.1 73.2 73.3 Lanska, DJ. (2009). "Chapter 30 Historical aspects of the major neurological vitamin deficiency disorders: the water-soluble B vitamins". Handb Clin Neurol. Handbook of Clinical Neurology. 95: 445–76. doi:10.1016/S0072-9752(08)02130-1. ISBN 978-0-444-52009-8. PMID 19892133. ↑ Zittoun, J (1993). "Anemias due to disorder of folate, vitamin B12 and transcobalamin metabolism". La Revue du praticien (in ฝรั่งเศส). 43 (11): 1358–63. PMID 8235383. ↑ "Folate and Your Health - HealthLinkBC File #68g". Healthlinkbc.ca. สืบค้นเมื่อ 2012-09-09. ↑ "EC 1.5.1.3". Us.expasy.org. สืบค้นเมื่อ 2012-09-09. ↑ "Bread fortification 'not justified'". The Sydney Morning Herald. 2006-07-29. ↑ 90.0 90.1 NZPA (2007-06-22). "Bread to be fortified with folic acid". NZ Herald. สืบค้นเมื่อ 2009-07-13. ↑ "Bread additive call 'up to NZ'". สืบค้นเมื่อ 2009-07-15. ↑ 98.0 98.1 "Welcome to the Health Canada Web site". Hc-sc.gc.ca. สืบค้นเมื่อ 2012-09-09. ↑ Chustecka, Z. (2009). "Folic-acid fortification of flour and increased rates of colon cancer". สืบค้นเมื่อ 2009-11-09. ↑ "Work Starts on Wilkinson's Mass Medication Plan" (Press release). Association Of Bakers. 2009-07-08. สืบค้นเมื่อ 2009-07-13. ↑ "NZ should push pause on folic fortification" (Press release). Green Party. 2009-07-09. สืบค้นเมื่อ 2009-07-13. ↑ NZPA (2009-07-08). "Bakers, Govt battle over folic acid". NZ Herald. สืบค้นเมื่อ 2009-07-13. ↑ "Govt reviewing folic acid policy". Stuff. สืบค้นเมื่อ 2009-07-15. ↑ "Put folic acid in bread". BBC. 2000-01-13. ↑ FSA (2007-05-17). "Board recommends mandatory fortification". สืบค้นเมื่อ 2007-05-18. ↑ "Backing for folic acid in bread". BBC News. 2007-05-17. สืบค้นเมื่อ 2007-05-18. ↑ "Experts back folic acid in flour". BBC. 2007-05-11. ↑ "FDA muffed chance to reduce birth defects". Boston Globe. 2004-01-06. ↑ "Birth Defects COUNT | Folic Acid | NCBDDD | CDC". www.cdc.gov. สืบค้นเมื่อ 2015-11-16. หน้านี้แก้ไขล่าสุดเมื่อวันที่ 15 พฤศจิกายน 2561 เวลา 11:40 น.